Wigs are Back & Better Than Ever! Whether you need a wig due to medical circumstances, natural hair loss, or as a fashion accessory, our highly-trained technicians are ready to accommodate you. Precision Hair carries wigs by Gabor and Henry Margu and we are the only certified Raquel Welch “Star Pro” salon in Delaware. These high quality, high fashion wigs are made of synthetic fibers that move and feel like human hair. Can people tell I’m wearing a wig? Raquel Welch™ wigs are virtually indistinguishable from a natural head of hair. Whether you choose a human hair or synthetic fiber wig, today’s state-of-the-art wig construction gives these wigs a realistic appearance. Today’s synthetic fibers are much thinner than they used to be, and thus avoid a bulky, “wiggy” look. Exclusive to Hair U Wear®, Kanekalon Vibralite® modacrylic fiber simulates protein rich hair for a natural, lustrous look and feel. The wide selection of colors reflect the multitonal shades that are re-quested in today’s better salons. In many ways, synthetic wigs are easier to handle than human hair because the style is baked into the fiber, keeping the shape intact day after day. However, many prefer human hair because the style is not baked in and can be changed using thermal or other styling tools used on one’s own hair. Human hair wigs give you the option to style the hair straight one day and curly the next. Thermal styling tools are not recommended on synthetic fiber wigs. In the 1960s, wigs were made with solid caps that were definitely hot and sticky. In the 70s, the Cap-less® wig was invented. Capless® wigs consist of lengths of fibers, called wefts, that are sewn to cotton or lace stretch bands which shape to the head while allowing air to circulate the scalp. In the late 90s, the Raquel Welch Signature Collection introduced the patented Raquel Welch Memory Cap. This cap replaces the wide stretch lace used in most of today’s wigs with a thinner, more resilient stretch material that actually molds to the shape of the head for a lighter, more secure fit. All Raquel Welch wigs, except those that are 100% hand-tied, are made with Raquel Welch Memory Cap construction. Choose a color that is as close as possible to your natural color. If hair loss is a possibility in the future, save a swatch of your own hair for a match. You can always go a shade lighter than your own hair, but avoid going darker. Our wigs come in a wide range of salon-inspired colors, so you should be able to easily find the shade that is right for you. The belief that all wigs are expensive is simply untrue. 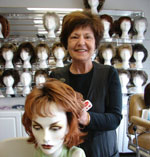 Wigs, like any piece of apparel, vary in price de-pending on the materials and craftsmanship. They can cost as little as $50 or more than $3,000. Some insurance companies will allow you to claim your wig. Ask your doctor to write a prescription for a “hair prosthesis”, and ask your wig professional to state the same on the sales receipt. You may want to do this at tax time as well. Our experienced wig consultants are sensitive to your needs and will usher you into a private room where you will have privacy. In addition, they can help you select a style and color that’s right for you, demonstrate how to put on a wig and instruct you in easy wig care methods. One last reminder, be sure to let your wig consultant know why are you looking for a wig, so that she can direct you to a dressing room or private area when the need arises. It is easy to summarize our goal at Precision Hair and Wig Boutique: we want you to leave our salon with a feeling that you have gotten the best products available and the service of our experienced staff. For more information please call 302-369-3311 and ask to speak with Sandy to schedule your free consultation to help you make the best decision for you with your hair loss situation, or if you have a friend who is in need give them our name and number. Our wig boutique has over a hundred wigs on display and hundreds more are available with overnight shipping if necessary. We have been chosen by Raquel Welsh to be the only “Star Pro Salon” in the area; a tribute to the training and expertise of our staff. Back in 2006 when the News Journal asked Sandy “Who or what has been your biggest source of inspiration and why?,” she answered “My greatest inspiration comes from chemotherapy or alopecia patient leaving my salon smiling, despite their ordeal.” When you meet Sandy you will know that this is true, what a wonderful gift she and her staff are to the many people suffering through the ordeal of cancer or alopecia. Precision Hair was born on October 1, 1986 in a small two chair salon located at 8th and Tatnal in Wilmington, DE. Its only employee was Sandy Tusi who nursed it. With little help for seven years working as the only employee, stylist, janitor, decorator, etc. she started what is now Precision Hair and Wig Boutique. In February of 1993, Precision Hair was an ambitious 6 1/2 years old and with considerable financial help, plans were drawn to move from the Tatnal Street Location, and open in the Delaware Trust Building with 1000 tenants. During the next five years Sandy really learned about the beauty business as an owner operator. The old saying that it takes 20 years to get 20 years of experience is a fact. To make a long story short, Delaware Trust sold out to PNC, the building population dropped to under 300 and profit was non existent. A move had to be made. Leaving most of her equipment behind, Sandy and one employee moved to the Kirkwood Highway location and at the request of several clients, Sandy began training in non-surgical hair replacement for men, women and children. It was now February of 1998; Precision Hair was 11 ½ years old and just starting to mature to the operation you see today. Sandy along with four employees were starting to make their mark. Precision Hair is over 20 years old, and we now have a staff of 20 stylists, receptionists and shampoo personnel to cater to your every hair need. We have remodeled the shop twice, most recently to take over vacated space next to our previous shop where we are proud to house The Precision Hair Wig Boutique. You can come in for a free, private consultation. The 2008 collection makes it easier than ever to change your looks, your mood or your personality, and why not? You can look like your very best self. You can be blonde, brunette or redhead or just and improved you. Glamour is being who you want to be. Next Story → Have You Ever Dreamt Of Flawless Skin Without Surgery?